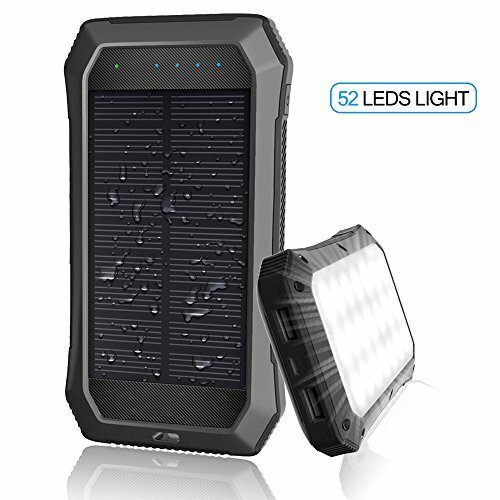 With 1.8W solar panel, recharge itself through the direct sunlight for emergency purposes, ideal for outdoor activities, such as camping, hiking,climbing etc. 24 white leds with bright light like a flashlight, enough to lit up your way at night. 28 red&blue leds with blinking light as an emergency warning light in the dark. Double click the power button to turn on the 24 white leds; continue to shortly press the button to enter into the SOS mode; once more to turn off the led light. Mini size, just as big as an iphone more or less, easy to storage in the pocket or backpack to carry on the go. Rugged heavy-duty design, water-resistant, shock-proof, dust-proof, perfect for outdoor using. The input max current up to 2A, if you use a 2A adapter, it will help you save half time to charge the power bank. The output max current up to 2A as well, help recharge your devices quickly as well. Due to the conversion rate from solar to electric energy is really limited, it may take a long time to fully charge the solar charger depending on the sunlight intensity, local weather and solar panel conversion rate. It is recommended to charge by outlet. If you have any questions about this product by URWILL, contact us by completing and submitting the form below. If you are looking for a specif part number, please include it with your message.